Is Economic Policy Ready for the Next Crisis? The economics profession took a big hit in the wake of the global financial crisis. Why did macroeconomists with their fancy models not see it coming? Should governments inject money into the economy to boost demand or cut spending to reduce record public deficits? And why have zero interest rates and ‘quantitative easing’ not done more to improve anaemic rates of growth? 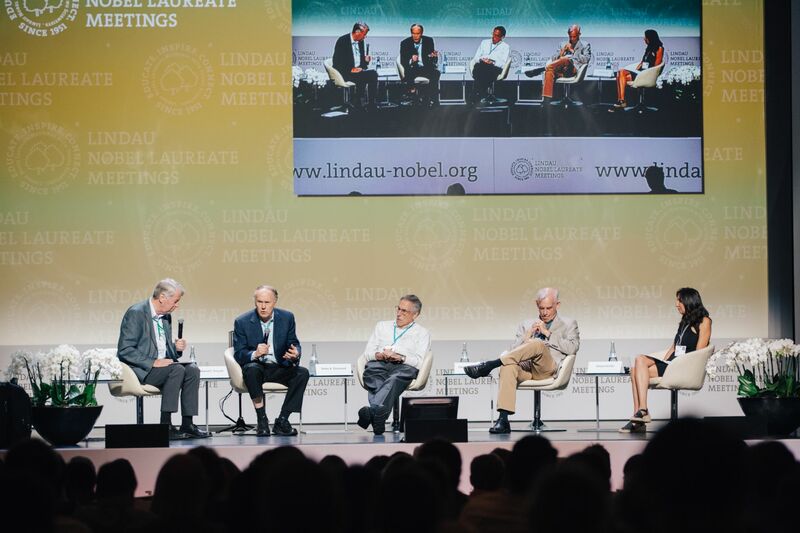 These questions and many more were up for debate at a panel of three Nobel Laureates and a young economist at the 6th Lindau Meeting on Economic Sciences on Friday 25 August. The participants considered the new conditions for monetary policy – cutting interest rates and rescuing banks – and fiscal policy – changing taxes and spending public money. They also asked why, before the crisis, policy-makers seemed to have paid insufficient attention to financial markets in their models. Mario Draghi, the President of the European Central Bank, used his keynote speech [link to video on LindauNobel site that I can’t access] that launched the Lindau meeting on 22 August to admit that there was a ‘notable absence’ of a role for banking and finance in these models. Martin Hellwig, the panel chair and director of the Max Planck Institute for Research on Collective Goods, started the discussion by highlighting that a debate over the effectiveness of fiscal stimulus policies in the US had been matched by one over austerity policies in Europe that involved doing the exact opposite. Peter Diamond, co-recipient of the Nobel Prize in 2010, said that the decision by the US government to pursue an active fiscal policy, which lessened the depth of the recession, helped to explain the gap between growth rates in North America and Europe since the crisis. But he acknowledged that the time lag involved in passing the legislation to push through fiscal measures, as well as concerns over what the money was spent on, had undermined people’s faith in the policies. Edward Prescott, co-recipient of the Nobel Prize in 2004, took a different view in a presentation with the title ‘The Unimportance of Monetary Policy and Financial Crises on Output and Unemployment’. He cited financial crises that saw countries experiencing contrasting outcomes at the same time: the US and Asia in the 2008 crisis; Chile and Mexico in 1980; and Scandinavia and Japan in 1992. ‘You are doing this because you want inflation to go up,’ he added, referring to the struggle that central banks have had to drive inflation up from current levels of close to zero. Sims urged young economists to fill in the ‘gaps’ in the major directions of monetary and fiscal policy research. But he also warned that many current research projects that simply seek to add extra elements to the standard ‘dynamic stochastic general equilibrium’ (DGSE) models, which were seen as having failed to spot the 2008 crisis, were just ‘fighting the last war’.